NEW YORK (AP) To avoid the embarrassment of a winless homestand, the slumping New York Mets needed to beat the top team in baseball with its best pitcher on the mound. Seth Lugo tossed six dominant innings in a stellar spot start, Todd Frazier hit a two-run homer and the Mets blanked the New York Yankees 2-0 on Sunday night to snap an eight-game skid. Frazier connected against Yankees ace Luis Severino, going deep for the second consecutive night to help the Mets prevent a Subway Series sweep at Citi Field. They ended a 10-game home losing streak and averted an 0-9 homestand that would have matched the worst in team history. Despite losing another important player to injury when second baseman Asdrubal Cabrera exited with a tight left hamstring, the Mets broke a six-game slide against their New York City rivals. The crosstown foes meet again at Yankee Stadium from July 20-22. Robert Gsellman worked two scoreless innings , bailing out Reyes after his double error gave the Yankees a chance in the eighth. Reyes threw well wide of first base on what should have been a 6-4-3 double play, and then a replay review showed he missed second base entirely on the pivot. Gsellman got a foul out and a flyout to strand the runners. ”We pick each other up,” Reyes said. Pitching in place of injured Noah Syndergaard again, Lugo (2-1) allowed only two singles and lowered his ERA to 1.77 in two starts and 21 relief appearances this season. He equaled his career high of eight strikeouts and didn’t issue a walk against a Yankees lineup minus slugger Aaron Judge. The right-hander retired his last 13 batters, threw 16 of 20 first-pitch strikes and extended his shutout streak to 13 innings. Anthony Swarzak finished the three-hitter for his third career save and first with the Mets, who won for only the fourth time in 19 games. Greg Bird was doubled off first base to end it when Gary Sanchez lined out to third base, with Frazier starting the game-ending double play. After the game, the Mets released slumping first baseman Adrian Gonzalez, who struck out in all three at-bats Sunday. They will call up first baseman Dominic Smith and utilityman Ty Kelly from Triple-A Las Vegas on Tuesday. Reserve catcher Jose Lobaton will be designated for assignment. Yankees: Judge was held out of the starting lineup to rest his jammed left thumb. The slugger pinch hit in the eighth and reached on an error by Reyes. 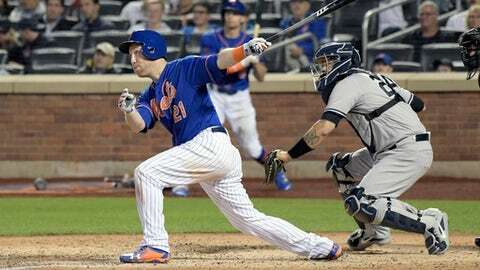 Mets: Cabrera, who leads the team with 11 homers and 36 RBIs, was removed in the fourth. ”It’s not a DL move,” Callaway said. ”He felt like he could have kept on going, but he didn’t want it to get worse. So we’re going to check on him (Monday) and then make that determination.” … LF Yoenis Cespedes (strained right hip flexor) had his minor league rehab assignment halted following a setback Saturday. He was headed to the team’s complex in Florida, and there’s no timetable for his return. The club had hoped Cespedes would be back Tuesday night in Atlanta. … Mets closer Jeurys Familia (sore shoulder) and infielder Wilmer Flores (sore lower back) are both headed to Florida and the team is ”very optimistic” they will be activated off the disabled list during the upcoming road trip, Callaway said. Yankees: CC Sabathia (3-1, 3.59 ERA) starts Tuesday night when Bryce Harper and the Washington Nationals visit Yankee Stadium for the opener of a two-game interleague series. Mets: RHP Zack Wheeler (2-4, 4.57 ERA) gets the ball Tuesday in a personal homecoming at Atlanta. Wheeler, who tossed seven shutout innings of three-hit ball last time out against Baltimore, is 4-2 with a 2.94 ERA in eight career starts vs. the Braves – though he hasn’t faced them since September 2014.